The ICWT-3000 industrial cooling water tank with integrated cooling spirals and pumps is designed for accumulation of cold water and its following utilisation for beer cooling in the second cooling stage and then for further cooling of particular tanks in the brewery. The condensing unit with plate heat exchanger (separated component that is not included as part of this cooling reservoir) is connected to primary circuit (cooling of media). Cooled tanks are connected to the ICWT in the secondary circuit. It is possible to install more condensation units in series. This tank is coupled with two pumps with capacity of 95 l/min for closed primary and secondary circuits. It is mounted on 4 adjustable feet and closed with a stainless cover. We recommend keeping condensation units within a max. distance from the ice water tank of 25 m. Antifreezer is not included in the delivery. We recommend to use non-toxic cooling liquid according to your possibilities. The ICWT-4000 industrial cooling water tank with integrated cooling spirals and pumps is designed for accumulation of cold water and its following utilisation for beer cooling in the second cooling stage and then for further cooling of particular tanks in the brewery. The condensing unit with plate heat exchanger (separated component that is not included as part of this cooling reservoir) is connected to primary circuit (cooling of media). Cooled tanks are connected to the ICWT in the secondary circuit. It is possible to install more condensation units in series. This tank is coupled with two pumps with capacity of 95 l/min for closed primary and secondary circuits. It is mounted on 4 adjustable feet and closed with a stainless cover. We recommend keeping condensation units within a max. distance from the ice water tank of 25 m. Antifreezer is not included in the delivery. We recommend to use non-toxic cooling liquid according to your possibilities. The ICWT-6000 is a coolant reservoir set that includes an industrial cooling water tank 6000 liters, external plate heat exchanger and two pumps. This set is designed for cooling and accumulation of cold water (usually with glycol) and its following utilisation for beer cooling in the second cooling stage and then for further cooling of particular tanks in the brewery. The condensing unit (separated component that is not included as part of this cooling reservoir) with plate heat exchanger is connected to primary circuit (cooling of media). Cooled tanks are connected to the ICWT in the secondary circuit. It is possible to install more condensation units in series. This tank is coupled with two pumps with capacity of 95 l/min for closed primary and secondary circuits. It is mounted on 4 adjustable feet and closed with a stainless cover. We recommend keeping the cooler within a max. distance from the ice water tank of 25 m. Antifreezer is not included in the delivery. We recommend to use non-toxic cooling liquid according to your possibilities. The ICWT-8000 is a coolant reservoir set that includes an industrial cooling water tank 8000 liters, external plate heat exchanger and two pumps. This set is designed for cooling and accumulation of cold water (usually with glycol) and its following utilisation for beer cooling in the second cooling stage and then for further cooling of particular tanks in the brewery. The condensing unit (separated component that is not included as part of this cooling reservoir) with plate heat exchanger is connected to primary circuit (cooling of media). Cooled tanks are connected to the ICWT in the secondary circuit. It is possible to install more condensation units in series. This tank is coupled with two pumps with capacity of 95 l/min for closed primary and secondary circuits. It is mounted on 4 adjustable feet and closed with a stainless cover. We recommend keeping the cooler within a max. distance from the ice water tank of 25 m. Antifreezer is not included in the delivery. We recommend to use non-toxic cooling liquid according to your possibilities. 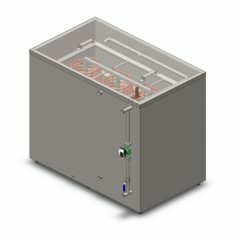 The ICWT-10000 is a coolant reservoir set that includes an industrial cooling water tank 10000 liters, external plate heat exchanger and two pumps. This set is designed for cooling and accumulation of cold water (usually with glycol) and its following utilisation for beer cooling in the second cooling stage and then for further cooling of particular tanks in the brewery. 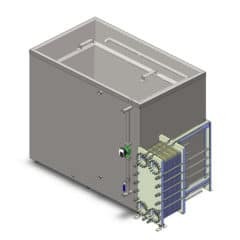 The condensing unit (separated component that is not included as part of this cooling reservoir) with plate heat exchanger is connected to primary circuit (cooling of media). Cooled tanks are connected to the ICWT in the secondary circuit. It is possible to install more condensation units in series. This tank is coupled with two pumps with capacity of 95 l/min for closed primary and secondary circuits. It is mounted on 4 adjustable feet and closed with a stainless cover. We recommend keeping the cooler within a max. distance from the ice water tank of 25 m. Antifreezer is not included in the delivery. We recommend to use non-toxic cooling liquid according to your possibilities.